Bay High Robotics Club members work on a robot for the 2018 FIRST Robotics Competition. Robotics, the technology of designing, constructing and programming robots to do automated tasks, is a growing field. The Bay High School Robotics Club, in its second year, is also growing and aiming to compete with some of the top high school robotics clubs in the area. The competition project is to build a robot that will compete in a very complex game. Each year, the game and its objectives are announced during the kick-off in January, at which time every team in the country begins building their robots. Clifford said that while the club lost two of its strongest seniors from last year, it has grown from 13 students to 22 students this year. Members meet once a week during the “off season,” but meet five days a week during the “build” season, building the competition robot once the specifications are released. The Bay High team ranked a respectable 33rd out of 55 teams last year, but only the top 24 teams qualify for the final tournament, whose winner is invited to the national competition. 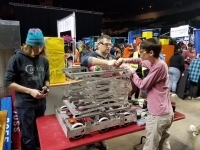 The Buckeye FIRST Robotics Competition is held the last weekend in March at the Cleveland State Wolstein Center, and Clifford is optimistic that Bay High’s team is strong and will do even better this year. The competition is more expensive than some, but Clifford notes that it is a national-level competition offering a high-quality competition that gives students an experience like no other. 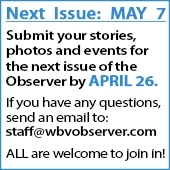 “We are very thankful for grant we’ve received from the Bay Village Education Foundation and from the Argosy Foundation, as well as funding from our local sponsors,” he said. Sponsors are NASA Glenn Research Center, Bay Village Kiwanis, Greg Allen Builders, Oster Services, Sixmo Architects and Engineers, KJ Trading Systems, and SurfTech. Students have raised money through a variety of fundraisers, including bake sales, raffles and a Spooky Halloween Science Lab. Anyone interested in becoming a sponsor as the club continues to raise needed competition funds, for this year and next, can contact Michael Clifford at Michael.Clifford@bayschoolsohio.org.